There are other incidents in his life that left indelible marks on his mind - the death of his sister and of his uncle whom he had loved so passionately. These painful experiences further intensified his urge to know and understand the higher question of life. He began to have serious misgivings about the capability of prevailing religious systems to provide satisfying answers to the serious queries regarding life, death and sufferings. He, however, resolutely continued with his mission to unravel the mysteries of life. He firmly believed that it was possible to attain salvation and triumph over death through the practice of yoga. His parents, having to come to know of his resolve, decided to get him married and fixed a day for the same to wean him from the pursuit of renunciation. Hurt, dejected and annoyed, Moolshankar fled his home and became a sadhu with a changed identity as Brahmachari Shuddha Chaitanya. Shuddha Chaitanya wandered here and there in search of truth and knowledge, and met a sanyasi, Swami Purnanand Saraswati. This sanyasi initiated him into the Saraswati order, and gave him a new name ‘Dayanand Saraswati’. Dayanand Saraswati took an extensive tour of India. It was during this time that he practiced yoga and learnt Vedanta Philosophy. In search of a teacher who could give him the right clues to spirituality and true knowledge, he wandered from place to place. All this time, he met only with those who could make good show with the outer paraphernalia of so-called ‘religious life’. After fifteen years of restless wandering from place to place and from teacher to teacher, in 1860, Dayanand reached Mathura and found the Guru he was searching for. He was a blind sanyasi called Virajanand Dandi - a great authority on Sanskrit grammar and man of heroic mould. His hatred of idol worship and traditional system of teaching were igniting fire in him. He had a pure soul, and was fully aware and proud of greatness of India’s glorious past. Dandi cast an everlasting influence on Dayanand. It was he who made clear to the young man his mission of life. Dayanand was fortunate to be under the tutelage of this enlightened soul consecutively for two and a half years at his ashram in Mathura. He developed implicit faith in the ancient books written by Rishis. On completion of his study, the Guru demanded a solemn pledge as ‘Dakshina’ from his pupil ‘to devote his life to the dissemination of knowledge and truth, and to wage an unrelenting war against the falsehoods propagated by the Puranic Hinduism, and to restore true teachings of the Vedas’. His words were: “Promise me that you will, as long as you live, devote everything, even give up your life, to the propagation of the books of the Rishis and Vedic Religion in India”. The next twelve years of Dayanand’s life were the years of preparation for accomplishment of the tremendous task he had set before himself. He left his master in 1863, and visited Agra, Gwalior, Jaipur, Pushkar, Ajmer, Haridwar, Benaras and several other places holding discussions with pandits, and fearlessly criticizing orthodoxy and scholastically denouncing idolatry. It was at Bombay (now Mumbai) that his mission took a definite shape in the form of his classical book - Satyarth Prakash - published in early 1875 and the founding of Arya Samaj on April 10, 1875. ‘One should always promote knowledge and dispel ignorance’. 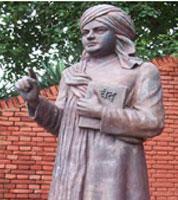 Scholars compare Maharshi Dayanand with Martin Luther. A closer look at their lives would indeed reveal many points of resemblance between the two. As Luther, a German monk, was a product of the European Renaissance, so was Dayanand a child of the Indian Renaissance; albeit in their different ways, both became exponents of the new spirit; Luther attacked indulgences, while Dayanand attacked idolatry among other things; Luther appealed from the platform of the Roman Church and the authority of the traditions spelt out in the scriptures of the Old and New Testaments, while Dayanand appealed from the Brahmanical scriptures and the authority of the Shrutis and the Smriti; and finally while “Back to the Bible” was the watchword of Luther, “Back to the Vedas” was that of Dayanand. The great religious preacher and social reformer, consequent upon his fatal poisoning, passed away at Ajmer on October 30, 1883.